New colours and lining plus contoured stitching patterns and short side zips for flexible access and ventilation add to the classic design flair and features throughout our popular Outwell contour range of square sleeping bags. All models enjoy an offset two-layer Isofill performance fill under polyester pongee fabric. Key features, such as zip-off hoods with built-in pillows and the neat inside pocket, continue in the five models adding more convenience for happy campers. 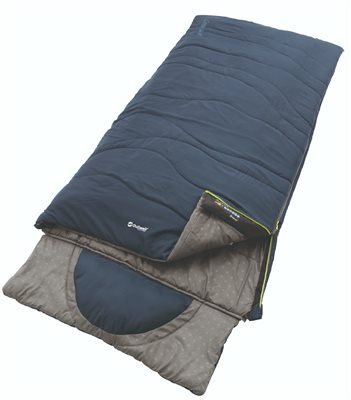 Contour Lux XL is a popular polyester sleeping bag with a two layer Isofill performance filling. Key features such as zip-off hood with built-in pillow and the flexible option to fully open up the bag as a duvet. Ample space with the XL width and length.